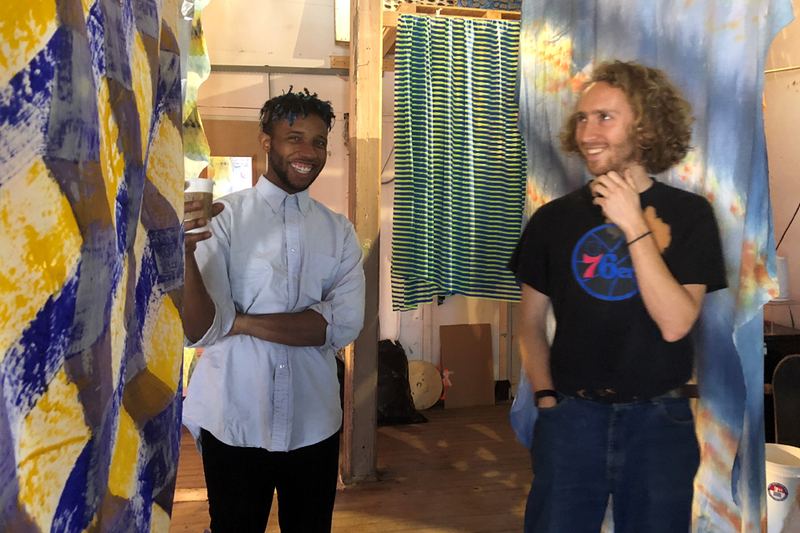 In their shared studio, multi-media artists Nick Carter and KYLE fabricate flags made from a variety of materials for “SHADOW FARMING,” a temporary installation commissioned for this year’s PVDFest. The flags are monotype prints made using an etching press, and each is uniquely designed to re-contextualize patterns from the urban landscape. Finding inspiration in ‘extremities that touch’ like hands, feet, and shoes, Nick Carter and KYLE play with the physical and ephemeral use of shadow as a metaphor for touch and presence. KYLE explained that the project calls to how “gentle gestures can happen even without the presence of a full body.” Installed in unexpected locations and designed to interact with changing sunlight, “SHADOW FARMING” will ebb and flow in and out of shadow across the entire PVDFest footprint. Sam O. White is inspired by the tension between the vain and empathetic impulses that animate the act of taking a selfie. The interesting thing about selfies and social media, he says, is that everyone wants to be their best self and at the same time is genuinely interested in what others are doing. He admits that taking a good selfie is hard. We spoke about how the ability to frame yourself as a visual statement raises the stakes – you can move towards a place where you like the way you look in a picture, but the sense of control can act as a blessing and a curse. “The Selfie Center”, to be installed during PVDfest, will invite strangers into space together to take selfies; it will make taking a selfie a social event. 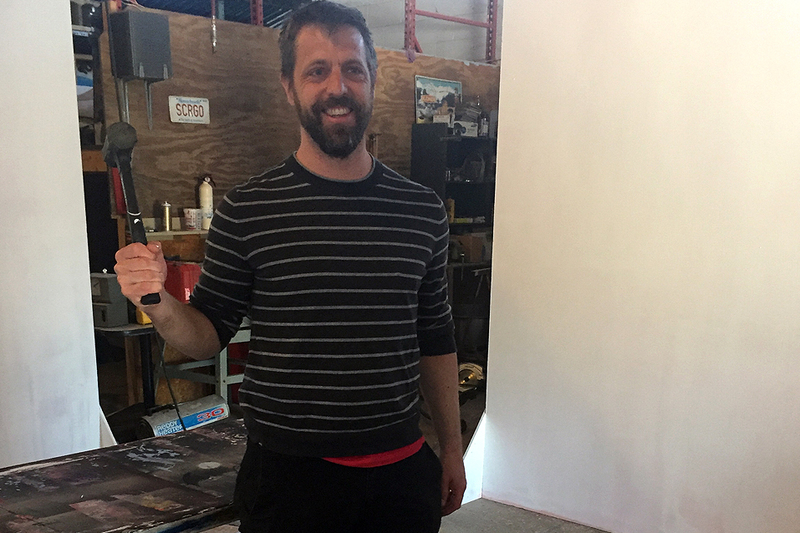 Working at both his Kinsley Avenue studio and at The Avenue Concept, he has already built and primed the Center’s four wood panels. Sam will be painting the boards next week. 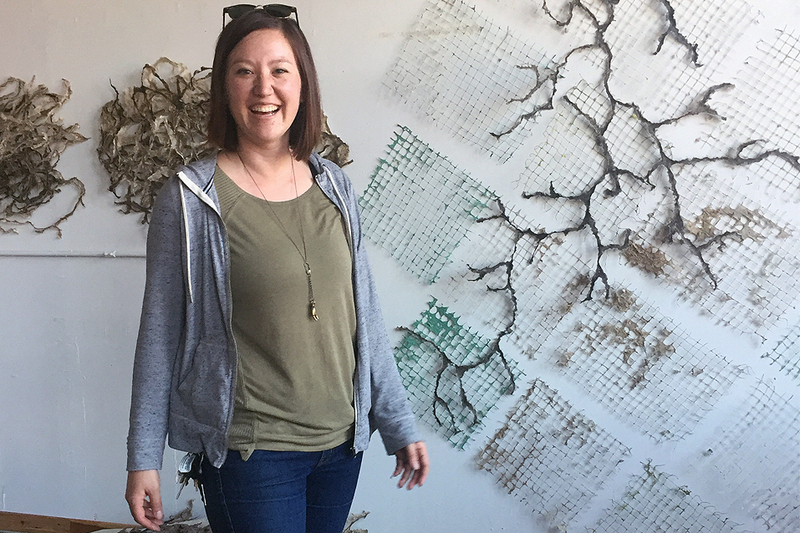 May Babcock jokes that she is a ‘fake scientist.’ An artist who makes paper by hand, May has nurtured her growing interest in plant stalks. 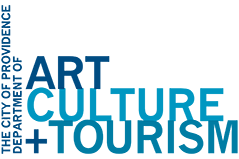 To make her work, she responsibly forages various plants at the beach, takes them off farmers’ hands, and pulls sea weeds off boat motors at marinas and docks. Her projects are site-specific and transcend time. For the work being commissioned for PVDFest, May looked at historic maps of what is now downtown Providence, learning that much of the area had once been a great salt water cove. Ironically, Babcock’s Harris Avenue “dry” studio stands in an area that used to be water. 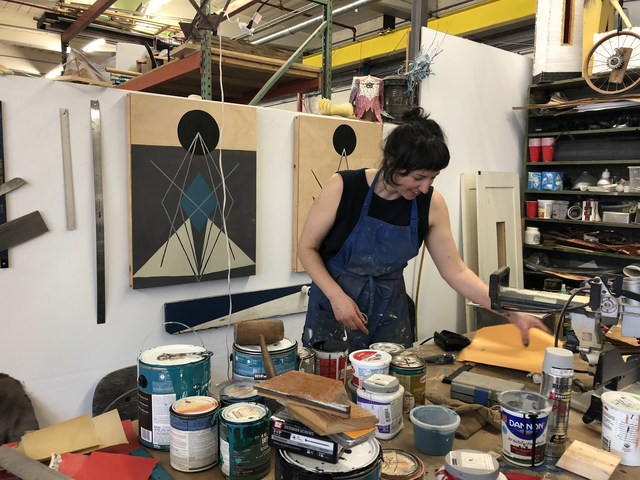 Her “wet” studio is in Pawtucket – there she beats and blends plant matter into pulp, mixing it with water and tinting it with watercolor or other plant-based dyes. The pulp is then poured into wood molds and then left to dry in the “dry” studio. 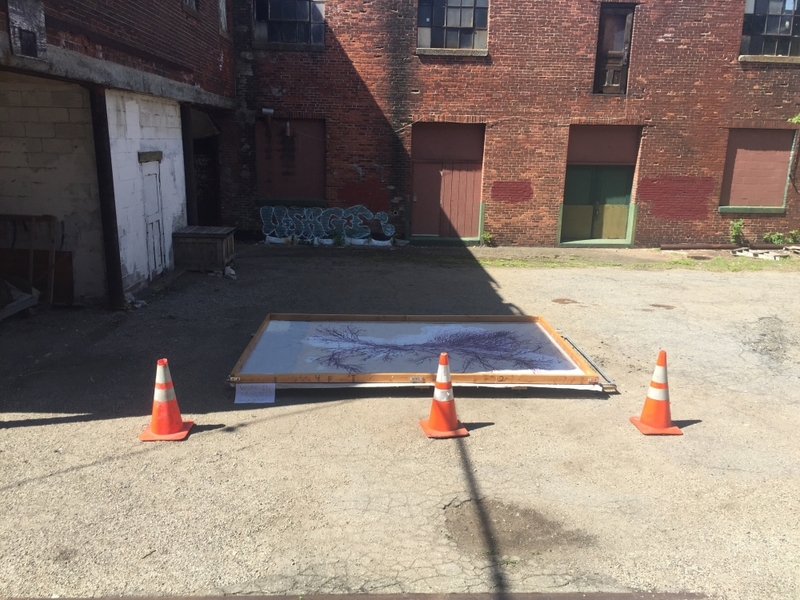 During our studio visit, one of the 8′ by 10′ pieces May will be installing during PVDFest was drying in the building’s courtyard. With its red seaweed pulp used to paint the watershed map of “Great Salt Cove Macroalgae,” May’s work is a hauntingly beautiful reminder that the festival footprint was once brackish water. Kristina Brown has been inspired by philosophical concepts and mathematical/geometric diagrams as a way to understand the world for many years, more recently incorporating the black sphere as an element in her work. For her the sphere represents unknown possibilities and potential, and its use in “Aperion” is loosely connected to Homer B. Sprague’s diagram in Milton’s Paradise Lost. Kristina spoke to us about how Anaximander, a Greek philosopher, used the term aperion to refer to the cycle of creation: “the world is not eternal and will be destroyed back into the apeiron, from which new worlds will be born. Thus, all existing things must pay penalty and retribution to one another for their injustice, according to the disposition of time.” From navigation to astronomy, cosmology and astrology, the lines and shapes that make up her compositions relate to perception and perspective as well as spatial and philosophical relationships.